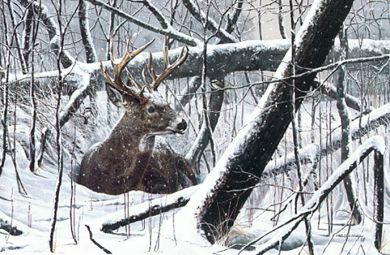 Quietly a Trophy Buck having watched the lone hunter approach, lies in the tangled blowdown, accompanied only by two Chickadees while a Hunter in the distance sits upon a stump with hopes of sighting a Deer on this cold and and snowy day. They are both playing the "Waiting Game". Lithograph, Image Size 22" x 14" with Ample Border. Shipped Flat.